Thomas Gunn is delighted to announce that Korea Lines, the marine transportation services company, is the latest ship owner to choose new Voyager 4 for its navigation requirements. It will be upgrading four LNG gas carriers from Voyager 3 to the new Voyager 4 digital chart management system with immediate effect. 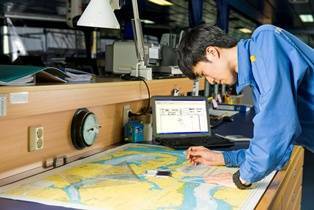 When asked why Korea Lines selected Voyager 4, Mr Cho Han-Ung, Principal Superintendent, Fleet Management Team 2 explained, “We needed a navigation solution which would best serve the needs of the internationally trading vessels operating within our fleet. Thomas Gunn’s new Voyager offers a range of options and unique features that enable us to navigate safely and efficiently in all areas.” New Voyager offers the only 100% complete British Admiralty update service, including key compliance requirements, Annual and Cumulative Notices to Mariners, Navarea Warnings and the Admiralty Information Overlay (AIO). It downloads, updates and displays both AVCS (Admiralty Vector Chart Service) charts and the AIO to overcome any limitations within the ECDIS system to help ensure the safest digital navigation. In addition new Voyager offers a number of additional services which enable the user to tailor each system to their own operating requirements. Regs4ships, findaport, AtoBviaC, Piracy information (via ICC) and Met515 are all available and displayed on one single GIS interface. “This is great news for Thomas Gunn,” says Mike Bailey, (Voyager Development Manager, Thomas Gunn Navigation Services). “We very much value the long term partnerships we have built up with our customers, and when the choice is made to upgrade it is a validation not only of the product but also of the level of service we have worked hard to achieve.” New Voyager 4 has the one of best data compression rates available today – making data download times both fast and extremely cost effective. It also includes a free Vessel Management Service to help ship owners and ship managers cut administration time, improve safety, better manage information and ensure compliance across the fleet - whether navigating with paper or using digital technology.